We explored participants’ perceptions of a person restoring or maintaining consistency with a clearly indicated in- or out-group status. In our study, participants (French students) had to judge a person freely choosing to behave contrary to or in conformity with initial attitudes. The target changed attitude to reduce dissonance and restore consistency (restoring consistency condition) or kept the attitudinal-behavioral consistency (maintaining consistency condition). The target had either the same nationality as participants (in-group) or a different one (out-group, Eastern European). Perception was then measured through two essential dimensions in social judgment: warmth and competence. 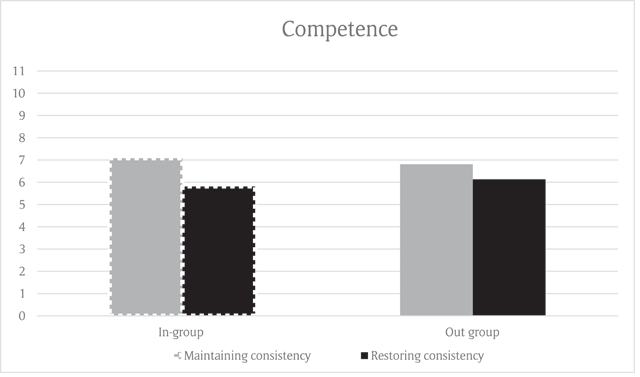 We hypothesized that the in-group target restoring consistency would suffer from negative judgments (i.e., black sheep effect), but findings suggest that the inconsistent in-group target was penalized only on the competence dimension. Meanwhile, as hypothesized, participants expressed in-group favouritism toward the in-group target maintaining consistency by ascribing higher warmth and competence compared to all other targets. Results suggest that attitude change as a dissonance reduction mode doesn’t necessarily undermine the global impression, only the perceived competence, while the appreciation of the attitudinal-behavioural consistency of an in-group member encompasses both dimensions. In daily life, we try to preserve harmony between our attitudes (internal) and our behaviours (external). People are motivated to be consistent (Abelson & Rosenberg, 1958; Heider, 1946; McGuire, 1960), because consistency is normative (Channouf & Mangard, 1997; Jouffre, Py & Somat, 2008). However, inconsistency occurs occasionally, provoking dissonance within the actor (Cooper & Mackie, 1983). Consequently, a person tries to restore consistency, preferably using a straightforward, not-so-demanding approach, such as an attitude change (Cooper, 2007; Glasford, Dovidio & Pratto, 2009). In this article, we are interested in perceptions of individuals that behave in a way that is or is not dissonance inducing. Specifically, we are interested in how a person who manifests attitudinal-behavioural discrepancy and then alters the attitude toward the discrepant act (i.e., restoring consistency condition) is perceived compared to a person who maintains consistency between attitudes and behaviour (i.e., maintaining consistency condition). This issue is explored as a function of the target’s group status. Results are discussed in light of attitude change as personal and vicarious dissonance reduction modes. Personal dissonance occurs when individuals behave contrary to their attitudes in a free-choice context (Brehm & Cohen, 1962; Wicklund & Brehm, 1976). This act initiates a state of arousal (Kiesler & Pallak, 1976; van Veen, Krug, Schooler & Carter, 2009; Martinie, Olive & Milland, 2010), which is followed by a negative emotional connotation motivating the actor to reduce it (Cooper & Fazio, 1984; Martinie, Olive, Milland, Joule & Capa, 2013). When the dissonant actor is considered an in-group member, a witness of the situation can also experience the aversive state and the need for consistency restoration (Blackman, Keller & Cooper, 2016). For example, participants felt dissonance arousal after hearing an in-group member simply agree to give a counter-attitudinal speech (Norton et al., 2003; Strain, 2009). Moreover, in order to reduce the vicarious dissonance and restore the consistency, participants changed their attitude toward the topic without hearing actual arguments (Monin, Norton, Cooper & Hogg, 2004). Although the dissonance experience is only vicarious, the outcome, such as an attitude change, is very real (Norton et al., 2003; Strain, 2009). Beside attitude change (Festinger & Carlsmith, 1959), several strategies of dissonance reduction have been identified: rationalization act (Beauvois, Joule & Brunetti, 1993), trivialization (Simon, Greenberg & Brehm, 1995), denial of responsibility (Gosling, Denizeau & Oberlé, 2006), and enhancement/derogation of a social group (Cooper & Mackie, 1983). Although each mode can fulfil the same purpose, certain elements are determinative, such as direct versus indirect paths to the source of dissonance, the needed effort for restoring consistency, and the importance of the dissonant elements for the person. Usually, the mode of restoring consistency is directly related to the source of dissonance (Glasford et al., 2009; Stone, Wiegand, Cooper & Aronson, 1997). For example, after committing a counter-attitudinal act, participants preferred behaviour change directly related to the personal dissonance rather than a positive act indirectly related to the dissonance (i.e., self-affirm through direct change of an inconsistent element versus self-affirm through indirect, dissonance nonrelated act) (Stone et al., 1997). Similarly, when personal dissonance is aroused by disagreement within the group (intra-group dissonance), strategies that restore positive group identity more quickly (e.g., outgroup derogation) are preferred over strategies demanding more behavioural effort (e.g., social activism) (Glasford et al., 2009). Finally, the importance of the inconsistent elements for the individual influences the dissonance reduction mode. When a strongly cherished value is violated by an in-group member, an individual can reduce personal dissonance through in-group disidentification (Glasford, et al., 2009), greater adherence to the inconsistent element (e.g., value-adherence activism) (Glasford et al., 2009), or misattribution of a negative arousal (e.g., derogation of an out-group) (Cooper & Mackie, 1983). When the inconsistent element is not of great importance, the change of belief is easier. For example, after writing a counter-attitudinal essay, participants can reduce personal dissonance by shifting beliefs toward the counter-attitude (Cooper & Mackie, 1983; Norton et al., 2003). This is preferred when beliefs are not crucial for the self (i.e., not a defining characteristic of the group identity) (Cooper & Mackie, 1983; Norton et al., 2003) or when implied change is in a positive direction (Götz-Marchand, Götz & Irle, 1974). Attitude change frequently fulfils all the criteria mentioned above: directly altering one’s preference is efficient and can be behaviourally noneffortful for dissonance reduction, especially if the element is not very important for the individual. As such, it comes out as a preferred mode of personal dissonance reduction (Martinie, 2003), and it can also reduce vicarious and intra-group dissonance (Cooper & Mackie, 1983; Monin et al., 2004). Overall, findings suggest that people are sensitive when committing or witnessing counter-attitudinal acts, highlighting the importance of attitude change in personal and vicarious dissonance inducing and reducing processes. However, the perception one holds of a person committing a counter-attitudinal (versus pro) act to restore (versus maintain) consistency has received limited attention in dissonance research. Knowing that personal and vicarious dissonance arise when an individual commits a counter-attitudinal act (e.g. Norton et al., 2003), we propose that observers will provide a derogatory impression of such a member when directly asked. On the contrary, we propose that a person maintaining consistency by expressing pro-attitudinal behavior will leave a positive impression. Additionally, we propose that these effects will be amplified for people perceived as in-group members. Although rare and inconclusive, findings suggest that perceptions of a dissonant person are more likely to be negative than positive. Barden, Rucker, and Petty (2005) found that an in-group member manifesting counter-attitudinal behaviour by saying one thing and doing another is seen as hypocritical, stingy, reckless, and hostile. When an in-group member doesn’t behave consistently with what is expected, judgments are particularly harsh. This is known as the black sheep effect (Pinto & Marques, 2008). An in-group member transgressing the norm (i.e., advocating against the dominant belief) is evaluated more negatively compared to an out-group member behaving in the same way and an in-group member manifesting a respect of the norm (Marques, Abrams & Serôdio, 2001; Pinto & Marques, 2008). Sometimes, in-group status can serve as a protective belt, as suggested by the in-group favouritism effect, which implies a more positive evaluation of a person belonging to the same group of the participant (Robbins & Krueger, 2005). In-group favouritism allows an individual to maintain a positive identity and to be distinguished from out-group members when the group identity is salient (Oakes & Turner, 1980). For example Strain (2009) found that an individual agreeing to give a counter-attitudinal speech regarding an associated group attribute was perceived better when the individual belonged to the same group as an observer (i.e., in-group status) than when the individual did not (i.e., out-group status). Generally, consistency is preferred on an individual level and as a social norm (Channouf & Mangard, 1997; Jouffre et al., 2001). Consistency was explored not only from the perspective of inter-individual differences, as a personality trait operationalized through preference for consistency (PFC) (Cialdini, Trost & Newcomb, 1995), but also from the sociocognitive perspective, as a norm that is socially valued (Allen, 1968). Channouf and Mangard (1997) observed that targets scoring high on PFC were better evaluated (e.g., better, more agreeable, and appreciated) than a target scoring low on the same questionnaire. Furthermore, Jouffre et al. (2001) found that pupils, when instructed to present themselves in front of their teacher in a positive light, increased their score on the PFC scale. Conversely, when instructed to present themselves in a negative way, they lowered their score (Jouffre et al., 2001). These results suggest the consistency norm is socially recognized and valued by individuals. A recent study explored perceptions of an individual scoring high, moderate, or low on the PFC questionnaire (Sénémeaud, Mange, Gouger, Testé & Somat, 2011). Participants were first informed of the target’s score on this questionnaire and then asked whether the target was an in-group member. Participants were then asked to judge the target’s personality traits. Findings revealed that the target scoring high on the PFC test was more easily categorized as an in-group member compared to targets with moderate and low scores. Moreover, the target with a high score on the PFC questionnaire was evaluated positively on traits covering the social utility dimension (competence) and negatively on the social desirability dimension (warmth) (Sénémaud et al., 2011). In sum, people behaving contrary to their attitudes are perceived in a more negative manner, potentially leading to a derogatory impression if they belong to the same group as the observer (i.e., black-sheep effect). Meanwhile, those behaving in line with their attitudes are seen in a positive way and as an in-group member. Hence, we expect that a dissonant (i.e., inconsistent) in-group member will suffer from a negative impression (i.e., black sheep effect) (H1), while a consistent in-group member will be awarded with a positive impression (i.e., in-group favouritism) (H2). Impressions and social perceptions are guided by two dimensions: social utility and social desirability (e.g., Cambon, Djouari & Beauvois, 2006; Pansu & Beauvois, 2004), also known as communion and agency (e.g., Abele & Wojciszke, 2007) or warmth and competence (Fiske, Cuddy & Glick, 2007). These variations in name do not reflect the differences related to the core findings; they come from a variety of approaches (see Fiske et al., 2007). Although people can use personality traits to justify social functioning and the position of individuals within a social system, these two dimensions are not socially anchored per se (Fiske et al., 2007). We opted for the stereotype content model (SCM) (Fiske et al., 2007), because it is used in a group context and a descriptive setting without a priori assumptions about social objectives or the functions these two dimensions have (Fiske et al., 2007). People spontaneously interpret the behaviour of others in terms of warmth and competence (Fiske et al., 2007). When trying to infer others’ intentions, people first evaluate the social and moral quality of the individual, which is the warmth dimension (e.g., sincerity, honesty, friendliness, sociability, attention). The second inference is regarding the ability to act upon existing intentions, which is the competence dimension (e.g., responsible, competitive, intelligent, efficient). Findings further suggest that the warmth and competence dimensions can be both negatively and positively related; thus, they are presented as orthogonal constructs (e.g., Fiske et al., 2007; Judd, James-Hawkins, Yzerbyt & Kashima, 2005; Kervyn, Yzerbyt & Judd, 2010). For example, studies suggest that immigrants (as an out-group) are a universally stigmatized minority, perceived as lacking both warmth and competence (Durante et al., 2013; Cuddy et al., 2009). However, in the United-States, Lee and Fiske (2006) demonstrated that perceptions of immigrant groups are a function of the groups’ national origin and can be seen through clusters that differ with respect to warmth and competence. In general, in the literature, the debate regarding the relation between dimensions is still ongoing (e.g., Brannon, Sacchi & Gawronski, 2017), with evidence suggesting divergent effects (see Binggeli, Krings & Sczesny, 2014, for social judgment dimensions and immigrants groups in Switzerland). Regardless of their positive or negative relation, these two dimensions have been repeatedly validated across both perception of groups and perception of individuals (e.g. Cuddy, Fiske & Glick, 2007; Judd et al., 2005). In our study, the target belonged either to the same group as participants or to a distinct out-group (young woman with a different nationality). Half of the participants observed the target transgressing consistency (i.e., committing a counter-attitudinal act) and then restoring it with an attitude change toward the discrepant behaviour. The target appeared unreliabe in consistency, even if she valorised it (consistency restoring condition). We opted for this operationalization of dissonant behaviour because this sequence of events is ecological (at least in a lab setting) and because attitude change is one of the most common and spontaneously used modes of dissonance reduction and consistency restoration (Martinie, 2003). The other half of the participants observed a target maintaining consistency between attitudes and behaviours. The target appeared to be highly reliable in consistency (consistency keeping condition). Participants were then asked to judge the target on traits covering the warmth and competence dimensions. We expected to observe more negative impressions of the in-group member who behaved in a dissonant way and restored consistency (i.e., consistency restoring condition) compared to the out-group member manifesting the same behaviour (H1a) and the in-group member maintaining consistency (maintaining consistency condition) (H1b). Moreover, we expected to observe the most favourable impressions for the in-group target behaving in a way highly in line with her attitudes (i.e., in-group favouritism for the in-group member maintaining consistency) (H2). We did not formulate any particular hypothesis on how the in-group favouritism and the black sheep effect would translate into warmth and competence perceptions, because the two dimensions can be both positively (e.g., Judd et al., 2005) and negatively correlated (Kervyn et al., 2010; Sénémaud et al., 2011). One hundred fifty-eight first year bachelor students of Poitiers University in France (125 female, mean age 20.83, SD = 7.12) participated in the experiment. Six participants were excluded due to a mother tongue other than French and three participants were excluded due to missing information, leaving 149 participants (41 in-group/maintinaing consistency, 37 in-group/restoring consistency, 36 out-group/maintaining consistency, 35 out-group/restoring consistency). Human investigation was conducted according to the principles expressed in the Declaration of Helsinki. Written consent was obtained from the participants. Four video clips were made for each experimental condition. The clips showed two persons: a marketing interviewer and a consumer (the target). Faces were not displayed; only the voices were synchronized to correspond with the scenario. In the clip, the consumer was allegedly participating in a marketing survey regarding perception of sweets (S, Bo, K, G, Ba, L). The clip was divided into two parts. At the beginning, the interviewer asked the target to spell her name and surname and to indicate her nationality and city of origin. This information was used as the manipulation of the group belonging with the target. The second part of the clip showed the target behaving in a way that is either consistent or inconsistent with the attitude she previously expressed. After the clip, participants were asked to use an 11-point scale, ranging from 0 (“Doesn’t characterize at all”) to 11 (“Completely characterizes”), to evaluate the target on 16 adjectives covering the warmth and competence dimensions (Fiske, Cuddy, Glick & Xu, 2002): warm, good-natured, friendly, sociable, loveable, honest, spontaneous, nice, intelligent, competent, understanding, reflexive, autonomous, efficient, reliable, performant. Participants concluded by providing their age, gender, and mother tongue. The study followed a 2 (group: in-group versus out-group) by 2 (consistency: Maintaining versus restoring) between-subjects design. Participants were randomly assigned to one of four conditions and informed that the study concerned social perception. In the in-group/maitaining consistency condition, the target was 24, she had a French name and surname, and she was born in Poitiers. She was speaking French with the accent of a native speaker. After this part, the video clip was paused and participants estimated on an 11-point scale to what degree they felt culturally close to the target (from 0, not at all, to 11, completely close). Then the clip continued, showing the target rearranging snacks in 5 categories: “I adore,” “I like a lot,” “I somewhat like,” “I don’t like,” “I hate.” These labels were written on papers fixed to the table. Participants saw the target’s hand rearranging the snacks and commenting her preferences: S, “I adore grilled peanuts with caramel”; Bo, “I somewhat like”; Ba and L, “I like a lot”; G, “I don’t like”; and K. “I hate.” After, the interviewer asked whether the target wanted to complete the next task by writing down five positive characteristics of the snack bar she categorized as “I adore.” The target accepted, hence manifesting behavior consistent with the initial attitude and not experiencing dissonance. After completing this task, the interviewer verbally confirmed that it was indeed 5 positive characteristics. Finally, the target was asked if she wanted to rearrange the sweet she initially categorized as “I adore.” In the maintaining consistency condition, she kept the initial response. In the restoring consistency condition, the target categorized the S bar as “I hate” and was asked to find five positive characteristics if she wanted. After completing this task, thus manifesting behavior inconsistent with her initial attitude, she was given the opportunity to rearrange the sweet. This time, the target restored the consistency and reduced dissonance by rearranging the sweet from “I hate” to “I somewhat like,” demonstrating an attitude change toward the discrepant act. In the out-group conditions, the target was a 24-year-old Serbian female from Belgrade who spoke French with a non-native accent. Everything else was identical. Depending on the consistency manipulation, she was either maintaining consistency without experiencing dissonance or restoring consistency to reduce dissonance. When the clip ended, participants were asked to provide their judgments of the target on the 16 adjectives listed above. The experiment was carried out in small groups (10–12 participants). Participants felt culturally closer to an in-group target (M = 6.80, SD = 1.68) compared to an out-group target (M = 2.59, SD = 1.75, t(147) = 14.97, p < 0.001), confirming successfulness of group belonging manipulation. We ran principal component analysis with varimax rotation in order to verify the factor structure. The Kaiser-Meyer-Olkin index was equal to 0.85, and Bartlett’s test of sphericity was significant, suggesting that the factor analysis could be performed (χ2 = 1397.99, p < 0.00). Following a Kaiser criterion, the four dimensions were extracted, explaining 70.41% of the variance (with the first explaining 44.15%, second 12.01%, third 7.47%, and fourth 6.77%, with their Eigen values 7.06, 1.92, 1.19, and 1.08, respectively). However, the scree-plot and Monte Carlo parallel analysis (see Watkins, 2005) revealed the two factors solution was more appropriate. The second analysis revealed that two components explained 56.16% of the variance (first 44.15% and second 12.01%, with Eigen values 7.06 and 1.92, respectively). The following items were loaded on the first dimension: friendly (0.86), nice (0.85), warm (0.84), sociable (0.80), loveable (0.72), good-natured (0.56), spontaneous (0.49). The second dimension was loaded with the following items: autonomous (0.77), performant (0.75), intelligent (0.73), reflexive (0.73), honest (0.68), competent (0.59) reliable (0.56), and efficient (0.53). Item understanding saturated both components to the same degree (first 0.48 and second 0.49, respectively), so it was not included in further analysis. Scale reliability was good for both dimensions (α = 0.88 and α = 0.85, respectively). Based on the same criteria, we reran the analysis to ensure that factor structure remained the same after excluding poorly discriminative items (understanding, good-natured, spontaneous, reliable, competent, honest, and efficient). The analysis revealed that two dimensions explained 70.91% of the variance (first 53.15% and second 17.76%, with Eigen values 4.78 and 1.59). The first component was named warmth because it was loaded with adjectives such as friendly (0.87), nice (0.86), warm (0.85), sociable (0.80), and loveable (0.74). Items covering the second component were autonomous (0.80), reflexive (0.77), performant (0.76), and intelligent (0.76). It was named competence. Scale reliability were good (α = 0.91 and α = 0.81, respectively). The two dimensions were positively correlated: r (149) = 0.47, p < 0.00. ANOVA were used to test our hypotheses. A global impression measure was inspired by Marques, Abrams, and Serôdio (2001) and calculated as a mean of warmth and competence scores. Analysis indicated that the main effect of group belonging was significant, suggesting that the in-group targets (M = 7.04, SD = 1.34) received higher scores compared to the out-group targets (M = 6.55, SD = 1.41, t(145) = 2.19, p = 0.03, η2 = 0.03). The main effect of the consistency was marginally significant, suggesting that the targets in the maintaining consistency condition (M = 7.02, SD = 1.28) received a higher score compared to the targets in the restoring consistency condition (M = 6.57, SD = 1.42, t(145) = 1.73, p = 0.08, η2 = 0.02). The hypothesized interaction between group and consistency was significant as well (t(145)= 2.04, p = 0.04). With respect to the black sheep hypothesis, we observed a lower score for in-group targets restoring consistency (M = 6.62, SD = 1.36) compared to the in-group targets maintaining consistency (M = 7.46, SD = 1.21, p = 0.04) (H1a) but not compared to the out-group targets restoring consistency (H1b). Regarding in-group favouritism (H2), the in-group targets maintaining consistency received higher scores compared to out-group targets maintaining consistency (M = 6.58, SD = 1.36, p = 0.02) and out-group targets acting dissonant (M = 6.82, SD = 1.48, p = 0.03). In sum, full black sheep effect was not supported, but the results suggest that in-group favouritism was observed: the in-group targets maintaining consistency left better impressions compared to all other targets (see Figure 1). Means of global impression indicating tendency toward in-group favouritism and the black sheep effect. On the warmth dimension, analysis revealed a significant main effect of consistency in favour of targets maintaining consistency (M = 7.36, SD = 1.49) rather than restoring it (M = 6.86, SD = 1.62, t(145) = 1.95, p = 0.05). The main effect of group belonging was significant (t(145) = 3.79, p < 0.001, η2 = 0.09), indicating that the in-group targets (M = 7.61, SD = 1.44) compared to the out-group targets (M = 6.62, SD = 1.69) were perceived as warmer. The data are plotted in Figure 2. Means of perceived warmth of each target, suggesting the main effect of group in favor of in-groups and the main effect of consistency in favor of targets maintaining consistency. The interaction was not significant (t(145) = –0.12, ns). However, it is worth noting that simple slopes analyses suggest that no differences in warmth perceptions appeared between the in-group targets restoring (M = 7.36, SD = 1.57) and in-group targets maintaining consistency (M = 7.83, SD = 1.30, ns), although a difference appeared between this condition and the out-group targets restoring consistency (M = 6.89, SD = 1.69, p = 0.04). We did find that the in-group target maintaining consistency was perceived as warmer compared to the out-group target maintaining consistency (M = 6.36, SD = 1.67, p = 0.05) and compared to the out-group target restoring consistency (M = 6.89, SD = 1.69, p < 0.001). On the competence dimension, neither the main effects of consistency, nor that of group were significant (t(145) = 0.01, t(145) = 0.53, ns respectively). However, the interaction between group and consistency was significant (t(145) = 3.69, p < 0.001). The evaluation of the in-group target restoring consistency (M = 5.87, SD = 1.69) was significantly lower compared to the in-group target maintaining consistency (M = 7.83, SD = 1.30, p < 0.01) (H1a) and marginally lower compared to the out-group target restoring (M = 6.14, SD = 1.78, p = 0.06). The evaluation of the in-group target maintaining consistency compared to the out-group target maintaining consistency (M = 6.81, SD = 1.30, p = 0.05) but not the out-group target restoring consistency was significant, partially confirming H2. Data are presented in Figure 3. Means of perceived competence. Significant differences in perceived competence are found between the in-group target restoring consistency and the in-group target maintaining consistency (H1b) and the out-group target restoring consistency (H1a), as well as between the in-group target and the out-group target maintaining consistency (partially confirming H2). The aim of our research was to examine the perception of a person with a clearly indicated group status transgressing then restoring consistency or keeping it intact. 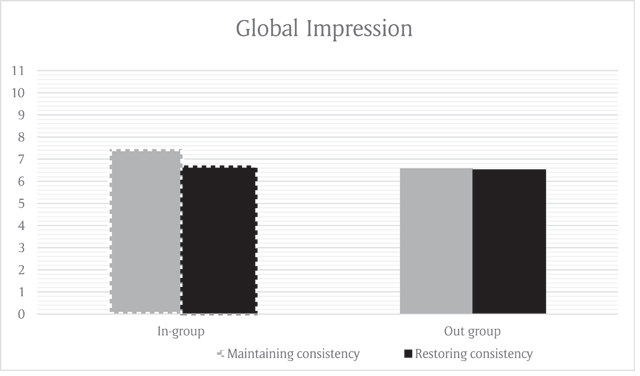 Taken together, our results show that, globally, in-group members left more positive impressions than out-group members and targets maintaining consistency were perceived more positively than ones restoring it. We hypothesized that consistency restoration and maintaining consistency can influence the social judgment of an in-group member. We expected to observe the black sheep effect when the in-group target behaved in an inconsistent way and restored the consistency (H1a and H1b), and we expected to observe in-group favouritism when an in-group member behaved in a way that reflected attitudinal-behavioural consistency (H2). Although we haven’t observed worse evaluations of the in-group target restoring consistency in comparison to the out-group target behaving the same (H1b), results do suggest that the transgression or the respect of the norm (i.e., consistency) has consequences on the global impression of the in-group target. The in-group member maintaining consistency is perceived more positively compared to all other targets, suggesting that participants manifested in-group favouritism toward the in-group target behaving in line with the consistency norm (H2), but also suggesting that the in-group target transgressing this norm was judged similarly to other out-group targets. The consistency restoring in-group target did not suffer the worst impression, dismissing the full black sheep effect, but results suggest there was the tendency. Namely, when these findings are separately considered on the two underlying dimensions of social judgment, we observed that the in-group members were perceived more warmly than the out-group members. Meanwhile, the perception of competence was affected by both the type of behavior and the group status of the target. Although the in-group target restoring consistency was penalized on the competence dimension, it was not sufficient to undermine warmth and lead to globally worse evaluations compared to the out-group target behaving inconsistently. However, this finding couldn’t be explained by the compensation effect: the negative evaluations of one dimension were not topped up by excessively positive evaluations on the other dimension (see Kervyn et al., 2010). Although statistically insignificant, this pattern corresponds to evaluations of the out-group target. Additionally, the in-group inconsistent member was not perceived as being warmer compared to the in-group consistent member. On the contrary, the in-group member maintaining consistency was awarded by the in-group favouritism effect as hypothesized (H2). Our results further support the idea that the preference for consistency is socially anchored (Channouf & Mangard, 1997; Louche, Pansu & Papet, 2001; Louche, Hugues & Sarrade, 2001). Individuals expressing strong preference for consistency are perceived as more stable, and others may more easily predict their behaviour (Channouf & Mangard, 1998). Hence, they are more positively evaluated on the social utility dimension, as suggested by Sénémaud et al. (2011). In another study, using a minimal group paradigm, Sénémeaud, Mange, and Somat (2016) found that in asymmetric intergroup relations, highly competent (high status) versus less competent (low status) in-groups are perceived to value consistency accordingly: more and less. Our findings are quite complementary: when manipulating consistency, we find superior evaluations of competence of in-group targets acting consistently with their initial attitudes. Moreover, we find that consistent members are also potentially warmer compared to persons behaving in an inconsistent way. However, it is only when the consistent person shares a perceiver’s group that the better evaluation occurs (i.e., in-group favouritism). Just like Marques and Paez (1994) argued, it is important for an in-group member to adhere to both norms: descriptive (e.g., national origin) and prescriptive (e.g., consistent behaviour). We haven’t observed complete devalorization of the in-group inconsistent member as we hypothesized. We put forward three elements as plausible explanations. First, our target behaved in the counter-attitudinal manner but also restored consistency by attitude change toward the discrepant act. This potentially signals that some value was ascribed to the consistency, leading participants not to penalize the in-group target entirely. Second, the mode of restoring consistency could save the inconsistent in-group target from being completely devalued. The target who behaved in an inconsistent way reduced her personal dissonance by attitude change. As mentioned, the attitude change is a mode spontaneously used by individuals and preferred over trivialization and a rationalization act (Martinie, 2003). When simultaneously provided with two or three means of dissonance reduction (attitude change, trivialization, rationalization act), participants used attitude change over other modes whenever they had the opportunity to do so. When this was not the option, trivialization and a rationalization act were equally preferred (Martinie, 2003). Moreover, the attitude change (versus trivialization) was preferred despite the higher cognitive effort it imposed on a person (Martinie & Larigauderie, 2007). Our results suggest that attitude change toward the discrepant act is also valued in a broader social context, potentially implying there is a trade-off between a cognitive and a social cost of attitude change in favour of the second. Other modes, such as trivialization, imply that a person doesn’t care more about the inconsistent element or belittle the ascribed value, which is not necessarily the case with attitude change. Some modes of dissonance reduction are more susceptible to diminishing both warmth and competence perceptions, while attitude change regarding a nondefining inconsistent element undermines only competence as our study suggests. Third, we cannot exclude that participants did not perceive the in-group member behaving in an inconsistent way as a deviant member. While definitional group attributes can be unique norms of the group, being a necessary and defining condition of group belonging, associated group attributes may be possessed by the group members without defining the membership (Pinto & Marques, 2008). Possessing definitional group attributes permit differentiating members from non-members and make the in-group positively distinct (Tajfel, 1978, 1981). In our study, we have checked whether the in-group target was perceived as belonging to the same group as participants; however, we haven’t introduced a direct measure of whether the target was perceived as being inconsistent or consistent. Inconsistency with personal preferences was perhaps seen as an associated, rather than definitional, group attribute and was not enough to perturb the stability of the group, leading to a black sheep effect. That is, individuals haven’t felt the need to restore the positive distinctiveness of the group because their positive group identity was not threatened. Although findings suggest participants perceived the inconsistent in-group target as deviant, the absence of this measure presents a limitation of our study. Findings suggest that attitude change as a dissonance reduction mode doesn’t necessarily undermine global impression, only perceived competence, while appreciation of attitudinal-behavioural consistency of an in-group target encompasses both dimensions. In line with and adding to existing literature, we also found that attitudinal-behavioural consistency is a valued asset, indicative of a target’s competence rather than warmth, but combined with specified group status, it can lead to superior evaluations of warmth and translate to in-group favouritism. Our results contribute to understanding how an inconsistent and consistent target is perceived in a context indicative of their group status. Also, our results support research that explored the social anchor of the preference for consistency (Channouf & Mangard, 1997; Louche et al., 2001; Sénémaud et al., 2011). Findings of Sénémaud et al. (2011) suggest that the target presented as having a high preference for consistency was perceived as competent and cold. We were interested in the perception of a person actually transgressing and restoring consistency with a clearly indicated in- or out-group status. As such, our study permits generalizing results from knowing someone’s preference for consistency to actually seeing them behave in a way that is inconsistent or consistent. Channouf, A., & Mangard, C. (1997). Les aspects socionormatifs de la consistance cognitive [Socionormative aspects of cognitive consistency]. Les Cahiers Internationaux de Psychologie Sociale, 36, 28–45. Cooper, J. (2007). Cognitive Dissonance: 50 Years of a Classic Theory. SAGE. Jouffre, S., Py, J., & Somat, A. (2001). Norme d’internalité, norme de consistance et clairvoyance normative. [Norm of internal attribution, consistency and normative clairvoyance]. Revue Internationale de Psychologie Sociale, 14(2), 121–164. Louche, C., Pansu, P., & Papet, J. (2001). Normes de jugement et appréciation du personnel. [Normative judgement and appreciation of personnel]. Bulletin de Psychologie, 54, 369–374. Martinie, M.-A. (2003). L’emprunt spontané des voies de réduction de la dissonance en situation de soumission forcée. [The spontaneous ways of reducing dissonance in situations of forced compliance]. Nouvelle Revue de Psychologie Sociale, 2, 237–243. Martinie, M.-A., & Larigauderie, P. (2007). Coût cognitif et réduction de la dissonance cognitive. [Cognitive Load and Modes of Cognitive Dissonance Reduction]. Revue Internationale de Psychologie Sociale, 4, 5–30. Pansu, P., & Beauvois, J. L. (2004). Juger de la valeur sociale des personnes: les pratiques sociales d’évaluation. [Judging social value of people: social practices of evaluation]. La Psychologie Appliquée à l’analyse Des Problèmes Sociaux. Paris: Presses Universitaires de France. Pinto, I. R., & Marques, J. M. (2008). L’effet brebis galeuses: réactions à la déviance en contextes entre groupes. [The black-sheep effect: reaction to deviance in inter-group context]. Revue Électronique de Psychologie Sociale, 3, 25–39. Retrieved from: https://sigarra.up.pt/fpceup/pt/pub_geral.show_file?pi_gdoc_id=565997. Sénémeaud, C., Mange, J., Gouger, A., Testé, B., & Somat, A. (2011). Social value of preference for consistency in intergroup relations. Revue Internationale de Psychologie Sociale, 24(3), 43–85. Strain, L. M. (2009). Reducing Vicarious Dissonance: The Role of Group-Related Attributes and Ingroup Identification in Reduction Strategy Selection (Unpublished doctoral dissertation). Miami University. Retrieved from: https://etd.ohiolink.edu/pg_10?0::NO:10:P10_ETD_SUBID:57254. Tajfel, H. (1978). Interindividual behaviour and intergroup behaviour. In: Tajfel, H. (ed. ), Differentiation Between Social Groups, 27–60. London: Academic Press. Wicklund, R. A., & Brehm, J. W. (1976). Perspectives on Cognitive Dissonance. Psychology Press.